All creation starts with one point. Donna Taylor of Taylored Dots Portraits knows full well of this very point and has mastered the technique of stippling, creating incredible, elaborate masterpieces with only dots, including the Indian Chief piece above. Years ago, I had the honor to interview this talented artist about her beautiful work and her mastery of the art. I wanted to share her amazing work and this interview with you guys right now because I felt like she really didn't get enough exposure from me that she truly deserves so although this is dated, I really hope you enjoy this interview. One of many I'll be doing in the near future, I'm sure. 1) The first obvious question is why dots? The use of dots is so different than what you see in most peoples art work, it is very therapeutic and offers a lot in detail to every portrait. Stippling is a very old technique, I first learned it in high school. My year 11 Graphics teacher gave us all a template of a VW Beetle to stipple, I instantly loved it. I spent hours on it, getting the shading perfect, where most people in the class finished it in about ten minutes. For my Year 11 final Graphics piece I Stippled A london Train Station (Brighton), again I obsessed about this and spent all year on it. For my final grade I received an A++ which I did not even know was possible. My friends and family also became obsessed with this piece as they saw my hard work and dedication go into it. The train station now hangs on my Mums wall, she loves it. This was my first official stippled piece. My attention to detail is a way of life for me, its a bit of an OCD thing as my husband would say. If one dot is out of place, I start again or spend countless hours fixing it. Crazy really. 2) When did you begin expressing yourself with art? I have always loved art. My Granddad was a painter, my dad- a great drawer and my sister is also very creative so really it has always been there. However drawing was always a side hobby for me. With a full time career working 50-90 hrs a week I rarely found time to pick up a pen, it was an outlet when I did. I find I always draw at my best when I am angry or upset. When I am happy I actually really struggle to be creative, which thinking about it, it is quite funny. I truly started to pick up the pen at the end of last year when I was really overwhelmed with my working life and I needed that outlet to clear my mind and make some big decisions. I started to finish my Indian and my husband was in aww… no one new I could draw and my husband, Pete secretly took a photo and posted it on his Facebook saying how proud he was. I was beyond distraught, being a perfectionist I was embarrassed. The response was amazing!! Peoples comment and likes were beyond anything I could have imagined!! People demanded that I put up the final piece so I did and people were offering to buy it. I next drew a portrait of my daughter and everyone was emailing me asking for me to do portraits of their children and that is where it all started. This was only about 6 months ago. Since then I have finished up doing Kids portraits as I like to draw what I want to draw. The reason I did not pursue an artist uni life (even though i was accepted to university twice) was because I hate being told what to draw. I enjoy it so much more when I am being creative in what I want to draw. 3) How long does one piece take on average? It depends on what I draw, most average around the 60hr mark. 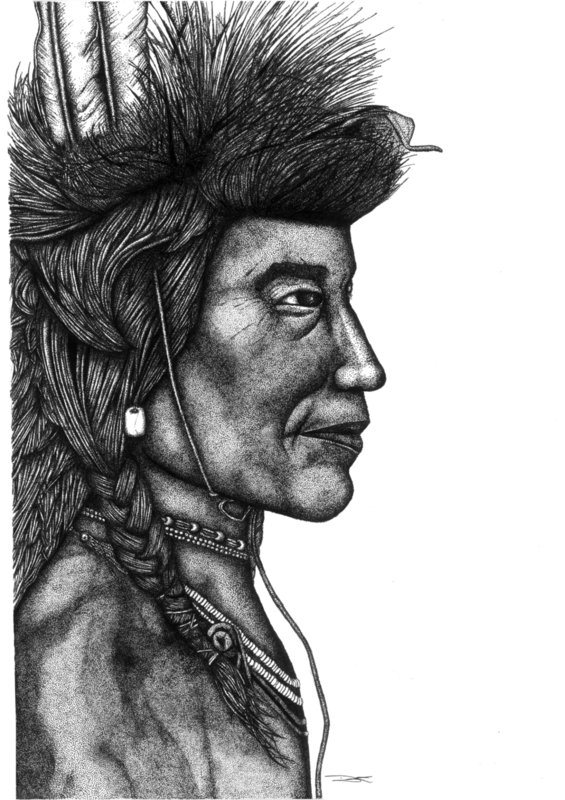 The Indian took me 4 yrs of drawing on and off during working full time and having a child, I started him before my daughter was even conceived and finished him when my daughter was 3 haha. With each drawing, if you put one dot out of place it can destroy the entire portrait. If this happens I tend to go over the portrait completely again, to layer it with another layer of dots all over. This makes the portrait one shade darker and takes up many, many more hours of my time. This definitely tests you and your commitment to the piece. If you don’t love it you move on but if you love it you work even harder to fix your mistake. My portraits are all done in pen and once there is one dot out of place you can not just erase it, it is there for life. You either fix your mistake or run from it, like everyday life really. 4) What inspires your portraits? I love portraits of traditional cultural people. National Geographic has such beautiful images that I find myself drawing many of their portraits. However, I have just started drawing animals but my heart still lies with drawing people and the expressions on their faces. I find I can be much more detailed when it comes to drawing a person rather than an animal. I think i have not truly mastered the art of drawing wildlife and the textures of their fur/feathers. People show so much expression and through doing these portraits I find myself thinking about who they really are, what they are thinking and I strangely build a little bit of a back story in my mind about who they truly are and their life story. When I am drawing I have a lot of time to think, maybe a little too much haha. 5) Who are your favourite artists/creatives? I truly do not have one. I am not one who lives and breathes art through being inspired by others. I think I am on my own journey and influence myself through making mistakes and truly loving each piece I do. I could not name many artists, that is not what I am about. 6) Do you create art in any other ways? If so, in what ways? I used to be a senior manager within fashion retail (finished to pursue an artist life) and this is where I was my most creative, telling stories through styling product and merchandising stores on a daily basis. My attention to detail was something I used to stress to managers who reported to me, it is important to follow things through until they are perfect. Other than that I am forever being creative with my daughter Milla (3), drawing, doing play dough, building Duplo houses and painting. She loves it. I bring out her creative side and Pete brings out her sportsmanship side haha. Let's see which way this little girl will go. 7) What’s your favorite piece and why? It would have to be my African Goddess. I drew her when I was going through a lot in my life, career change and life struggles. She helped pull me through the tough times, helped me clear my mind and pulled me throughout to the other side. She is the one that I sell the most, she is just beautiful and when drawing her I was truly addicted. She sucked me in and consumed me. I have also built a family of portraits around her now, a mother and a husband. These have been made for them to be sold as sets, where they look at each other. I carry her around with me everywhere on my phone (cover). When I look at her she reminds me of the tough times and how you can always get through them, just keep going… just keep dotting.